The benefits of aloe vera for your skin are undeniable. If you’ve ever cut open a leaf for use on a cut, scrape, or sunburn, you’ve experienced it first hand. But aloe vera may possess even greater healing power than many realize, potentially preventing and halting skin cancer in its tracks. In addition to reducing wrinkles, researchers from the University of Belgrade School of Medicine recently confirmed that the constituents in aloe vera stops proliferation of cells that accompanies skin cancer. With skin cancer, cells proliferate (or multiple rapidly) as skin tumors develop. To stop this cell growth, you can stop the tumors from developing. The researchers found that Aloe-emodin stopped cell proliferation. In conjunction with this finding, the researchers discovered that although the isolated aloe compounds were protective, the whole herb extracts were even better. What this means is that identifying the beneficial compound in the plant is great, but when you remove it from the plant to isolate it and use the isolated compound in a treatment, it is far less effective than when used as part of the plant. The gel of the Aloe leaf and its other plant parts contain many constituents outside of those tested in these studies, including quercetin, luteolin, apigenin, kaempferol, isoorientin, isovitexin, saponarin, lutonarin, chlorogenic acid, pectic acid, caffeic acid, 5-P-coumaroylquinic acid, caffeoylshikimic acid, feruloylquinic acid, coumaric acid, ferulic acid, as well as glycosylchromone aloeresin B, and aloin, which is a precursor to Aloe-emodin. Other studies have also demonstrated aloe’s ability to stop the progression of skin cancer when applied directly to the skin. 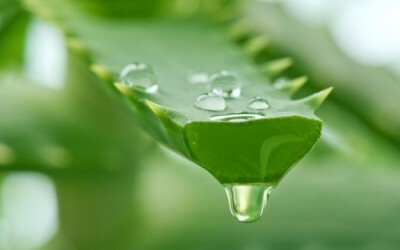 It is suspected that aloe very stimulates the production of melanin and other protective substances. So, using fresh aloe vera gel for sunburn relief may pull double-duty, soothing the burn and protecting the skin from cancer. And of course everyone knows that burn relief is among many other health benefits of aloe vera. One of the best things about aloe vera is you can grow it yourself in your home or your yard (if you are in a warmer climate). It’s a great first aid treatment and is excellent for a variety of skin conditions. I have been using Aloe Vera for the past twenty years for skin problems, for everything from burns, to scrapes, and actually what I am certain was a melanoma. I have a good-sized aloe plant at home, and just cut off a small piece, open it up, and tape it on top of the affected area. In ALL cases, the Aloe Vera has CURED the problem. This is an amazing plant, and I find it amazing that the medical community has all but ignored Aloe’s healing properties. Probably because it is not an expensive drug. Is it my imagination, or do physicians prescribe drugs which are made by companies that they have stock in? Never mind all that…next time you have ANY kind of skin problem, tape a piece of Aloe Vera on top of it, and leave it on for about a week. You will be AMAZED! It is ESSENTIAL that you use a piece of the actual, real plant…NOT something that comes in a jar or bottle! And when it clears up, don’t bother telling your physician…you’ll just get a smug, patronizing smile letting you know that THEY are the doctor, and you are an idiot. Aloe Vera is the best plant for the health. This is very useful for different usage . Aloe vera is a really good plant,try it! * I can guarantee a cure for skin cancer…spread some cannabis oil on affected area & watch it disappear!…oh by the way…it cures ALL other cancers thru ingesting said high-grade oil…for thousands of years…proven!…phoenixtears,ca/ or google: Rick Simpson…'Pig Harmaceuticals'-doesn't want you to know about it,,,these sadists would rather torture you with a slow & agonizing death, with toxic chemo poisons that make them lots of $$$$$……'First do no harm???? '…Would you let a Rockefeller perform eye surgery on you?? ?…well that's who dictates the chemo/allopathic cure, so they can steal all of your $$$$ from your grand children…..don't be fooled…now you know!! !